When you pull up to 5612 Nutone St., you can’t help but feel welcome. 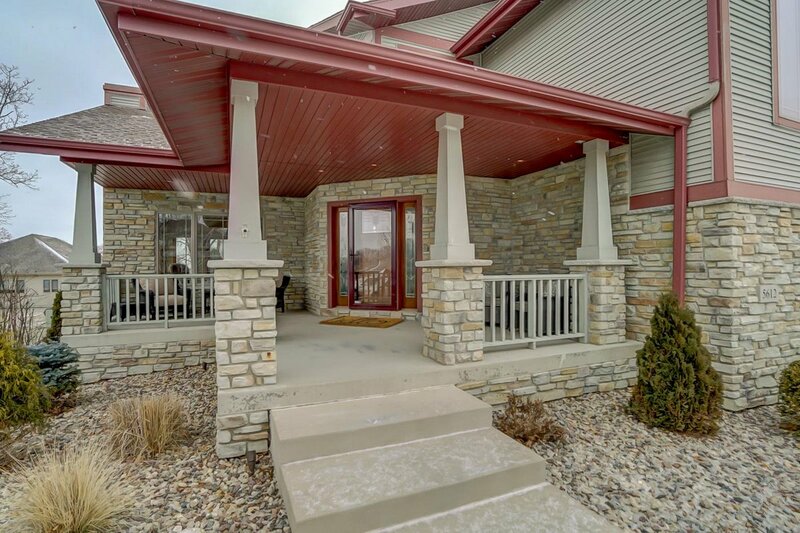 From the Craftsman-style architecture with its stone accents to the deep red Prairie-style trim, you immediately feel right at home here. And then there’s the front porch. It’s not flashy. It doesn’t demand to be noticed — but you will notice it. Wide open and yes, welcoming, it sets the stage for the front entrance. But more than that, it provides the perfect setting to pull up a couple of chairs, grab a cool drink and watch the world go by (well, in the warmer months at least). Once inside, you’ll find yourself standing in the grand 2-story entrance hall. 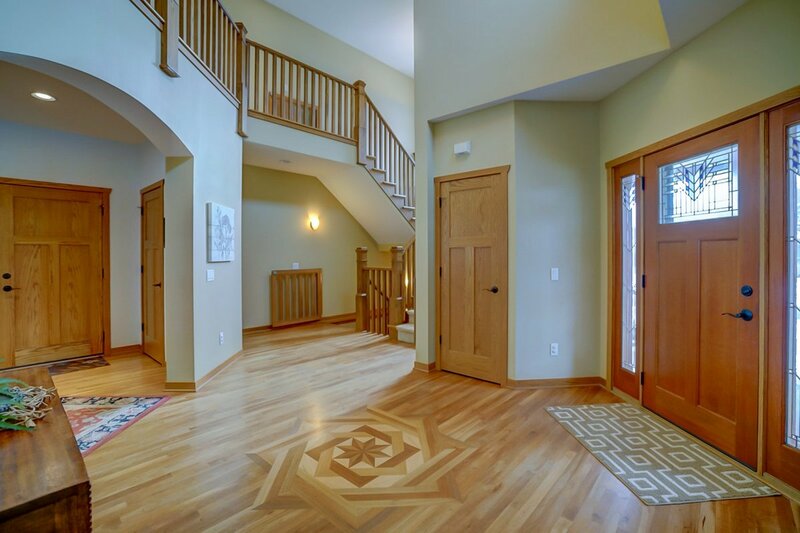 Custom-built by NorthPointe Construction, this former 2005 Parade Home features art-glass windows, solid craftsman doors, Pottery Barn wall colors and cherry floors throughout — including the front entry floor where a beautiful inlaid star pattern takes center stage. To your left is the Great Room. 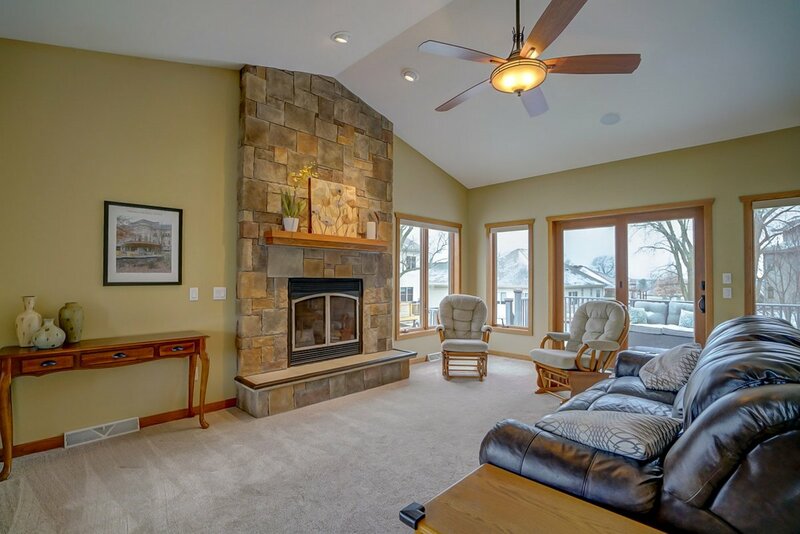 This spacious room features a vaulted ceiling, stone fireplace and carpet newly installed in 2017. There’s plenty of room here for a wall-mounted TV. But if you prefer the great outdoors, there’s a large deck just outside. 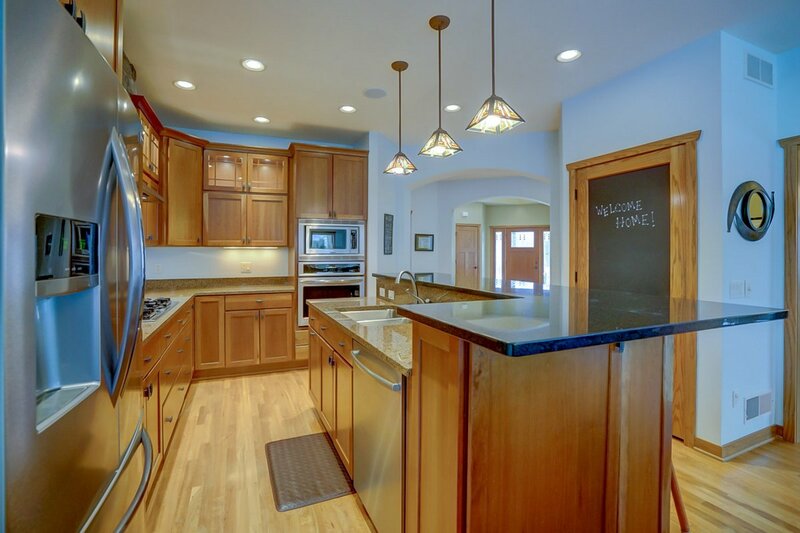 The front entrance also provides easy access to the kitchen straight ahead. A granite-topped island breakfast counter is perfect for a quick bite. And the newer oven, dishwasher, refrigerator and microwave were all added within the last couple of years. Oversized cabinets offer plenty of storage and the glass doors on the top row provide a great way to showcase anything from artwork to heirloom china. A glass tile backsplash gives the room a touch of color. Whether you have a large family or just like to keep track of your grocery list, you’ll love the large chalkboard-door pantry where you can make lists, leave notes or doodle to your heart’s content! Inside, laminate shelving can easily hold plenty of staples (and maybe a little junk food). 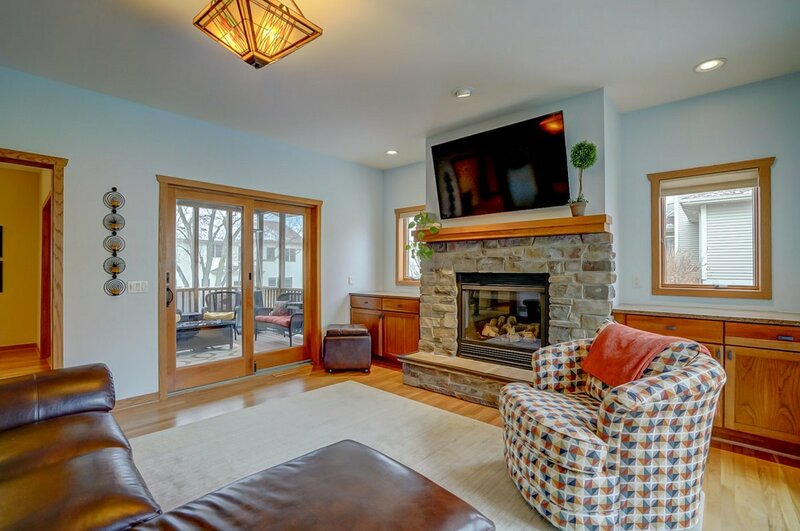 An open floorplan leads to the adjoining family room — making it a great place for reading, entertaining or lending help with homework. This room features built-in storage cabinets, a stone fireplace with room for a large TV above, and prairie-style lighting fixtures. From here, sliding doors provide easy access to the large screen porch. Between the kitchen and the Great Room, there’s a formal dining room — with a second entrance to the attached screen porch. And a main-floor powder room with a pedestal sink, is conveniently located nearby for use by family and guests alike. The home has 4 bedrooms — 3 on the 2nd floor and 1 on the lower level. The stairs are set off by a beautiful custom-built railing — with custom-designed safety gates attached. And take note of the light coming in through windows accented with unique prairie-style grids. 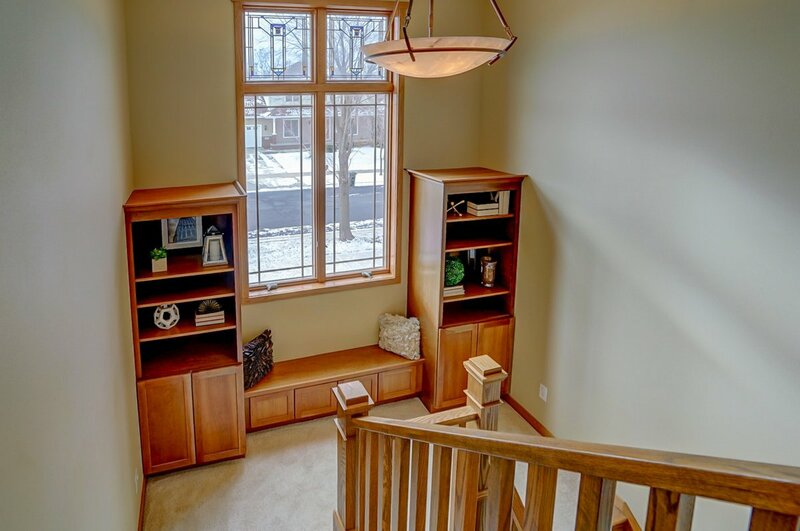 On your way upstairs, you’ll pass a landing with built-in shelves and a bench seat. What a perfect place to curl up with a book! A loft at the top of the stairs also offers a place for a comfy chair or desk. A large master bedroom gives you plenty of storage space with two closets — a walk-in right off the bedroom — and another even larger walk-in closet off the master bath. And that closet isn’t even the best part about the bathroom! There’s a large soaking tub with an art-glass window and a huge walk-in shower with built-in body sprays and a pebble-floor. A conveniently-located 2nd-floor laundry provides storage cabinets and large counters for folding. The other 2 upper level bedrooms are perfect for kids or guests. They each have good-sized closets and the rooms are separated by a sunny and bright Jack-and-Jill bathroom, with separate sinks and a shared tub/shower. 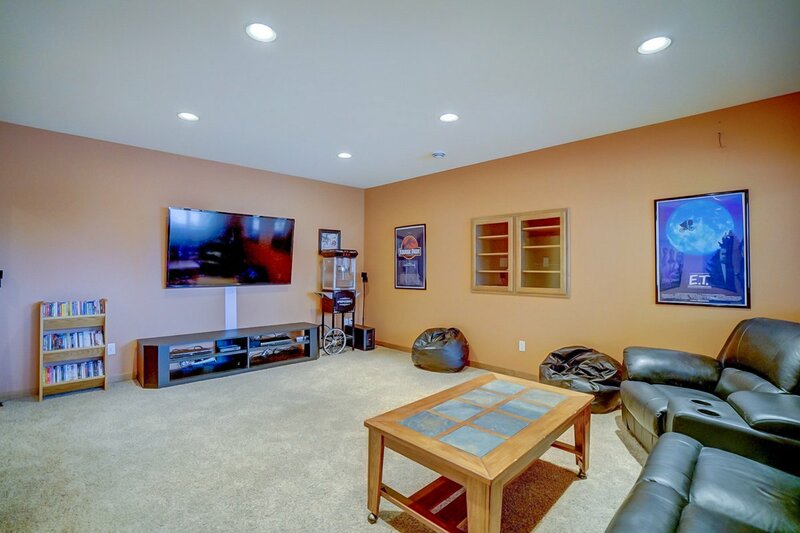 Head back downstairs, and on the lower level you’ll find a carpeted Rec Room perfect for a home theater or to hang out with family and friends. This level is fully-exposed with look-out windows. There’s another full bathroom with cabinets, a cultured marble countertop and a bathtub with attached shower. This level is home to the 4th bedroom with its large double-door closet and built-in book case. And you’ll be amazed by the huge lower-level storage area. Currently unfinished, this is great for storage or even as a workout room. It spans most of the length of the house, offering lots of space for future expansion. 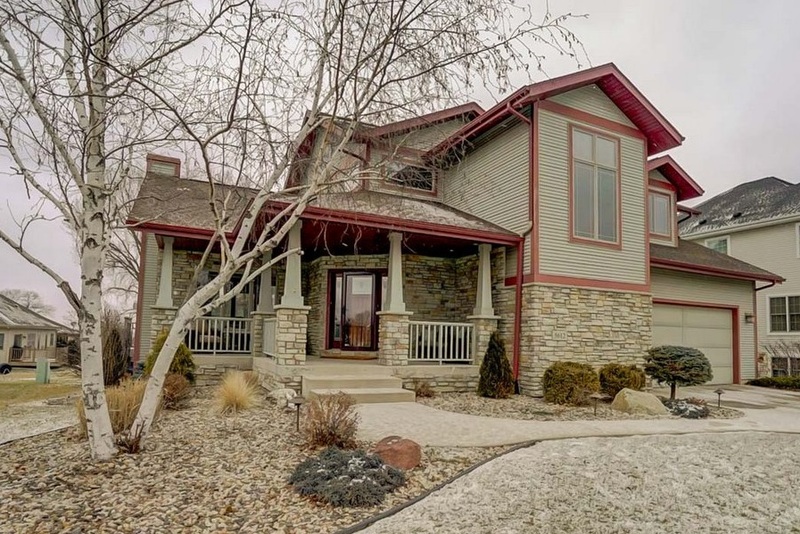 There’s a lot to like with this 3,823-ft home (3,032 finished above-grade) both inside and out. Prairie landscaping encircles the foundation and holds an extensive array of outdoor landscaping lights. 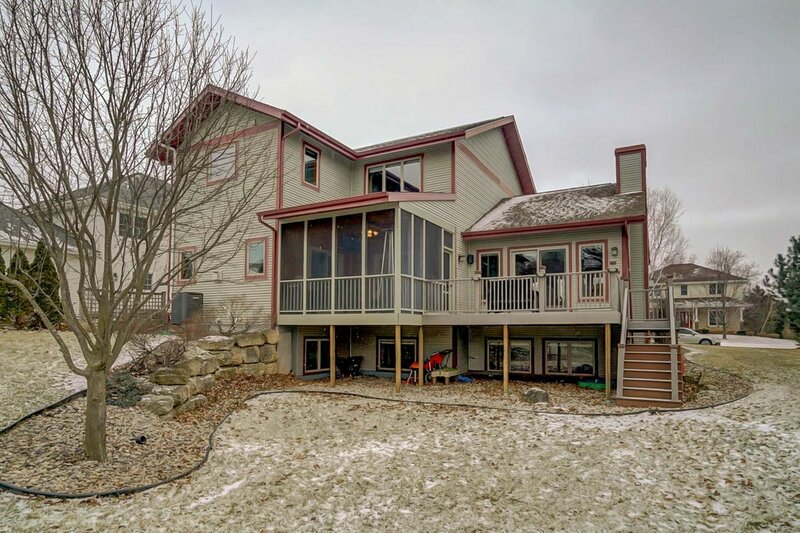 There’s a nice backyard and large deck accessible from both the yard or inside the home. The 3-car tandem garage would be perfect for a 3-car family. Or you can put that extra space to good use as a workshop or for extra storage. Oak Meadow has a lot to offer Fitchburg residents. There’s a neighborhood park and a trail for walking or biking. The Fitchburg Library and Farmer’s Market are a stone’s throw away. For commuters that don’t want to deal with downtown parking, there’s a bus stop within walking distance. And the easy access to and from Fish Hatchery or Lacy Roads will get you on your way to the Beltline and beyond in just a matter of minutes. Explore your dream home today! Contact Barbie for a personal showing or for more information on this home or any other property listed for sale.